TRAINER Chris Heywood has chosen to give his star apprentice jockey son Nick a well earned Sunday off calling up a pretty reasonable replacement for his Parkes Cup hopeful Leucura in none other than ‘Cups King’ himself, Greg Ryan. Nick, who is based at Randwick with Peter and Paul Snowden, has ridden Leucura at 21 of the horse’s 36 starts, piloting him to five of his six wins. And while Sunday will be Ryan’s first time on the six-year-old, no one is complaining — least of all Chris Heywood himself. “I am happy to have Greg, if you want the best, you get the best and I am lucky enough to have done that,’’ he said. “Nick and I did talk about him coming to Parkes, if I sent three of four horses he might have come out for me but he’s got a pretty busy schedule so I just said to him to stay at home and have the day off. Leucura ran out of his skin in the Wagga Town Prelude two starts back when flashing home late from the rear to finish third, beaten a little more than a length. 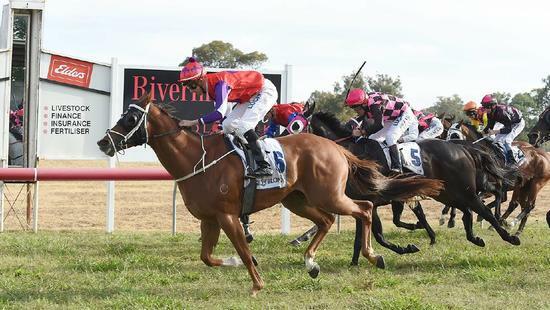 Even though he clocked in well down the order last time, he was still only 1½ lengths off the winner in another 1200m race at Wagga. “He got held up all the way up the straight with 62kg on his back and never really got a chance to get a crack at them,’’ Heywood said. Sunday’s feature is at 1600m and while it is a significant step up in distance, Heywood is confident the horse has done the work to meet the challenge. “I probably would have preferred it to be 1400m but in saying that he’s had two 1000m races and three 1200m runs this prep so he is well and truly fit enough to run a mile,’’ he said. Leucura is yet to win at 1600m but was runner-up at his only three attempts, one of them in the Forbes Cup, another in the Narromine Cup. It is hard to imagine a better-bred horse going around at Parkes on Sunday than Leucura’s stablemate Imperious who leads out the field in the Tony’s Windscreens Handicap (1300m). The chestnut gelding is a son of Winx’s sire, Street Cry, out of Joe Pride’s Group 1 Coolmore Classic-winning mare Regal Cheer. Not only is Regal Cheer a daughter of Golden Slipper placegetter Regal Chamber, she is also the dam of Newmarket and Oakleigh Plate runner-up Knoydart. While Imperious has been unable to reach those lofty heights, the former Godolphin-housed galloper is cherry ripe for a sixth win in Sunday’s assignment after a slashing run at Wagga during the carnival with Tommy Berry on board. “Tommy was pretty impressed, he actually thought at the top of the straight that he might win,’’ Heywood said.